Orthodontics is the branch of dentistry that corrects irregularities of the teeth, jaws and face. 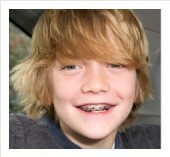 The orthodontist re-positions teeth and jaws that are not in their correct alignment and position. Orthodontists specialize in not only the cosmetic appearance of your childs teeth but also in the overall health and long-term functionality.